Some athletes earn disapproval for their failures on the field. Ernie Broglio became the object of scorn of media and fans alike for being the pivotal piece of a one-sided trade during the 1964 season. The 6-foot-2-inch right-handed pitcher had been a solid part of a strong starting rotation formed in the early 1960s under the direction of St. Louis Cardinals general manager Bing Devine, but was traded to the Chicago Cubs for a then-unknown outfielder, Lou Brock. Brock went on to be instrumental in two Cardinals World Series championships and eventually was elected to the Baseball Hall of Fame, but the unfortunate Broglio won only seven more games in his career. Ernest “Ernie” Gilbert Broglio was born in Berkeley, California, on August 27, 1935, the second child of Anna and Joseph Broglio, and in 1945 moved with his family five miles north to El Cerrito. “I had played a lot of ‘street ball’ while growing up in Berkeley,” he recalled.1 “I never had anybody influential push me. My dad carried two jobs seven days a week. He was a painter (sprayer) for American Standard (bathroom fixtures), and he did gardening work so he did not have much time to see me play.” As a middle-school eighth-grader Broglio played on the varsity high-school teams, mainly baseball and basketball. He also played one season of football. During the spring of 1953, Broglio recalled, “All 16 major-league teams and three Pacific Coast League teams were interested in me. I signed right out of high school with the Oakland Oaks. He won two games and lost four for the Pacific Coast League team. The next season the Oaks farmed him to Modesto of the California League, where he won nine games in a month and a half before being recalled by the Oaks and going 5-8. Broglio also enrolled at West Contra Costa Junior College, where he met Barbara Ann Bertellotti of Oakland. They were married on November 20, 1954. In 1955 Broglio was assigned to Stockton (California League) and won 20 games. He started 29 games with 25 complete games in a 20-10 season. He had 230 strikeouts and 137 walks. Team locations changed dramatically for Broglio after the 1955 season as his contract was bought by the New York Giants organization. In 1956 he had a 6-12 record in 31 games at Johnstown, Pennsylvania of the Class A Eastern League. Broglio was with the Dallas Eagles (Texas League) in 1957 and was 17-6 in 34 games with a 2.51 ERA. He had 29 starts and 14 complete games in 222 innings. He was voted to the Texas League all-star team, the third time he had earned that distinction. (The others were in 1954 and 1955 in the California League.) Broglio started the 1958 season with the Phoenix Giants (Pacific Coast League) before he was transferred to the Toronto Maple Leafs (International League). He was 8-1 for Phoenix and 9-4 for Toronto in 212 innings. However, Broglio was 0-5 by the middle of June. His first win came in St. Louis against Philadelphia on June 16. He scattered 10 hits through seven innings and won a 5-2 decision. On June 27 he had his best major-league game so far. At Crosley Field in Cincinati he pitched a complete-game, two-hit shutout, winning 5-0. He had six strikeouts and walked no one. (He had come into the game having walked 33 batters in 54 innings.) Broglio appeared in 35 games and started 25 during the 1959 season and ended with a 7-12 record in 181 innings. His ERA was 4.72 with six complete games and three shutouts (which tied for the team lead). He was second on the team with 133 strikeouts. Broglio was not projected as a part of the regular rotation in 1960. He came into the second game of season on April 13 in relief and pitched six strong innings against the Giants in San Francisco. His first start came four days later in Los Angeles. He did not get through the fourth inning, walking six and giving up five runs. Broglio’s next start, came on May 30 and he was matched against the Dodgers’ Don Drysdale at the Coliseum. The Cardinals jumped on Drysdale for five runs in less than two innings. Broglio struck out eight, scattering four hits and three walks in his first complete game of the season as the Redbirds romped to a 15-3 victory. He even chipped in with two hits, three runs batted in, and two runs scored. Manager Hemus said he was thinking of putting Broglio into the regular rotation. Broglio won seven of his next nine decisions to move his record to 21-7, with an ERA of 2.52. But the Cardinals faded after mid-August to end the season in third place behind Pittsburgh and Milwaukee. Broglio was 4-0 against the Pirates and 5-2 against the Braves, and finished the season with a 21-9 mark. His ERA of 2.74 was second in the league. He tied Warren Spahn for the league lead in wins and led the league in winning percentage (.700). After the season he was offered a $5,000 raise by the Cardinals. In 1961 Broglio was the Opening Day starter but he pitched with a sore right shoulder most of the season and received close to 20 cortisone shots. He ended 1961 with a 9-12 mark. He had 26 starts, seven complete games, and two shutouts. He hoped the offseason would give his shoulder time to heal. In 1962 Broglio finished with a 12-9 record and 3.00 ERA. He boasted a career-high 11 complete games in 30 starts. His four shutouts were part of a staff that led the NL (17). 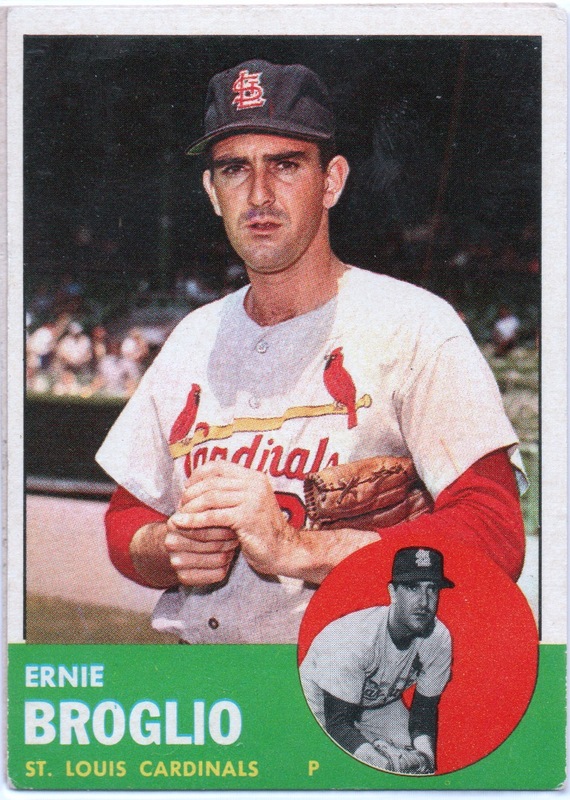 Broglio was the Cardinals’ Opening Day starter on April 9, 1963, against the Mets in the Polo Grounds, and pitched a two-hit shutout and struck out eight. He two-hit the Mets in New York again on June 8, this time striking out 10. From August 30 through September 15, the Cardinals won 19 of 20 games and pulled to within a game of the league-leading Dodgers. Broglio had four quality starts during this streak with two victories, improving his season mark to16-8. Then on September 16 he started the first game of a big three-game series in St. Louis and went eight strong innings. A stiff right elbow, however, led him to be removed for a pinch-hitter with the game tied. The Dodgers scored twice in the ninth against two Cardinal relievers to win, 3-1. Broglio won two more games to finish with an 18-8 record. In a career-high 35 starts, he had 11 complete games to go with five shutouts and an ERA of 2.99. He had four two-hit shutouts. On April 14, 1964, Broglio was again the Opening Day starter, at Los Angeles, and lost to Sandy Koufax. On April 18 he defeated the Giants in San Francisco; on the 28th he shut out the Mets. But Broglio lost three straight starts from May 14 through May 24 to drop to 2-4, and manager Johnny Keane’s confidence in him started to fade. Keane kept juggling the rotation and now had six starters. On May 30 in St. Louis Broglio beat the Reds, 7-1, in a complete-game effort. But from then through June 14 the Cardinals lost 11 of 15 games and dropped to eighth place. The bats of several Cardinals went silent and the outfield platoon to replace the retired Musial was not working. It was alarm time within the front office with rumors that something would happen before the trade deadline. Broglio started on June 12 in Los Angeles, but Koufax blanked the Cardinals again. Broglio’s record was now 3-5. In 11 starts his strikeouts were noticeably down to three per game. On June 14, after the Dodgers swept the series, the Cardinals boarded their plane for Houston. General manager Bing Devine had been busy on the phone right up to departure and later he sat by Keane during the flight. Devine said, “I can make the deal with Chicago.” Keane’s response was either “Make it!” or “What are we waiting for?” depending on what account the St. Louis fans read. As soon as they landed in Houston, Devine called Cubs general manager John Holland. Three other trades in the major leagues were announced on June 15, but none proved larger than the one between the Cardinals and the Cubs. Broglio added, “When I was traded, my right arm was not in fine tune. My elbow was really bothering me, and pitching in so many day games was not my piece of cake. In my opinion, the hitters see the pitches better than they do at night.” For the Cubs, Broglio started 0-4 with an 8.22 ERA before he won against the Mets on July 16. He started against the Cardinals and Bob Gibson on July 28 in Chicago. He held his own for three innings before being touched for six earned runs and was lifted in the seventh ending with a no-decision. Broglio rebounded to win his next three starts, improving his combined record to 7-9 and lowering his ERA to 4.42. On August 23 Ernie woke up in his New York hotel room with a problem. His right elbow had swelled to the size of a cantaloupe and was in a locked position. Broglio was to start one of the games of a doubleheader that day at Shea Stadium. He knew that was not going to happen, so he called Bob Kennedy to tell him about the issue. Kennedy had Broglio return to Chicago to get treatment. After two more losses, Broglio took the mound on September 6 to start the series finale against the Cardinals in St. Louis. While the Cubs had dropped to eighth, the Cardinals were now in third place. Broglio allowed six hits, but St. Louis could not break through against him. In the bottom of the seventh he held a 3-1 lead and was lifted in favor of Lindy McDaniel. Chicago was still leading 4-2 in the bottom of the ninth. A run scored when Brock grounded out as Flood took second. One more out and Broglio would have a satisfying victory over his former team. But Bill White singled to tie the game, and in the 11th Brock’s bad-hop single drove in the winning run. Broglio started again against St. Louis on September 11 at Wrigley Field before a small afternoon crowd, and lost, 5-0. He was now a combined 7-12 and was shut down for the rest of the season due to his elbow problem. His record with the Cubs ended at 4-7. Broglio made his first 1965 appearance on April 27 at Cincinnati, a one-third inning relief stint. He appeared in 26 games and had six starts during the season. On June 27 in St Louis, he lasted 1? innings and left trailing 4-0. It was apparent that he had not been given the time needed to recuperate. His season record ended at 1-6 with a 6.93 ERA, with his last appearance on September 19. Leo Durocher was named the Cubs’ manager for 1966. Broglio had several outstanding spring-training performances at Long Beach, California. Durocher noted that Ernie had become a pitcher again by mixing a slider and a fast curve, before using his fastball. Broglio was put into the rotation, but things did not go well. He started the second game of the season, on April 13 at San Francisco. He was wild but went seven innings. He gave up four runs and took the loss as the Cubs were shut out. Broglio made his last start for the Cubs on June 22 in Chicago in the second game of a doubleheader with the Giants. It was dismal as he allowed seven runs and was booed by the Wrigley Field fans. After two relief appearances, on July 5 he was sent to Tacoma of the Pacific Coast League. Broglio started 13 games for Tacoma and had a 5-4 record with a 2.86 ERA. Broglio gave pitching one more shot in 1967 with the Buffalo Bisons, the Triple-A affiliate of Cincinnati. He was 12-13 in 28 starts with a 3.69 ERA, but no call came from the Reds. During this season, one of his catchers was 19-year-old Johnny Bench, who was 5 years old in 1953 when Broglio started playing baseball for a living. Broglio was 32, and he went home to San Jose, California, and took a full-time position with the liquor warehouse where he worked in the offseasons. Ernie and Barbara Broglio raised four children, Stephen, Nancy, Donna, and Vince, and had three grandchildren and one great-grandchild. (Their son Stephen died in October 2007 at the age of 52.) As of 2011 the Broglios still lived in the San Jose home they bought in 1959. Broglio invested in an award-winning winery run by his son-in-law, Jack Salerno, in Healdsburg, California. In April 2009 Broglio was inducted into the El Cerrito High School Athletics Hall of Fame. Birnbaum, Phil, Bill Deane, and John Thorn, eds. Total Baseball - 8th edition. Toronto: Sports Media Publishing, Inc, 2004. Braun, Kevin. Baseball Savvy: Diamond Notes & Commentary. March 5, 2009. www.baseballsavvy.com/w_broglio.htm (accessed October 31, 2010). —. Redbirds, A Century of Cardinals' Baseball. St. Louis: River City Publishers Limited, 1981. —. "On Cards' Trade." St. Louis Post-Dispatch, October 8, 1958. Castle, George, and Jim Rygelski. The I-55 Series, Cubs vs. Cardinals. Champaign, Illinois: Sports Publishing Inc, 1999. Cohen, Richard and David Neft, eds. The Sports Encyclopedia: Baseball, 14th edition. New York: St. Martin's Press, 1994. —. The St. Louis Cardinals, 1892-1992. New York: St. Martin's Press, 1992. Tiemann, Robert L. Cardinal Classics. St. Louis: Baseball Histories, Inc, 1982. 1 Unless otherwise indicated, all remarks by Ernie Broglio come from correspondence with him. 2Rains, Rob. Cardinals, Where Have You Gone? Champaign, Illinois: Sports Publishing LLC, 2005, pp. 64-65. 5Rains, Rob, op. cit., p. 65.